LandCentral is successful because it streamlines the land-buying process with its customers in mind. At LandCentral, we offer the least-expensive land available, without bank or agent fees. Plus, our loan pre-approvals makes closing the deal and paying for your land even easier. It’s easy to look at different properties no matter where they are. Simply browse our properties online from the comfort of your home. Our website lets you shop for the property you want, whenever you want. With almost two decades of experience, we can provide any help you need along the way. Just ask. Everything we do is designed to save you time, money and hassle. SAVE THOUSANDS by buying land directly from the seller. Skip the large, upfront costs and enormous fees charged by banks and real estate agents. That means LOWER PRICES FOR EVERYONE. You have 24/7 premium account access. There are no sales people, pushy agents or greedy banks. Browse at your pace, on your time. There are no subjective loan applications. You’re pre-approved. 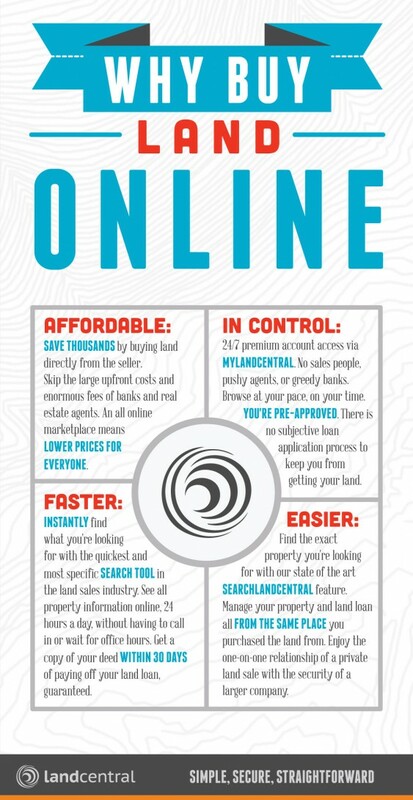 QUICKLY find what you’re looking for with the best SEARCH TOOL in the land sales industry. See all property information online, 24 hours a day. Get a copy of your deed WITHIN 30 DAYS of paying off your land loan, guaranteed. Manage your property and land loan all FROM THE SAME PLACE you purchased the land from. Enjoy the one-on-one relationship of a private land sale with the security of a llarger company.